Restrictus explored the Institution as a place of restriction. Square boxes made out of red PVC tape were placed on the floor of the exhibition and around the feet of people entering the space. The piece was simultaneously streamed live on Facebook and fed back through a monitor within the exhibition space. The space, which had been deemed suitable for exhibitions was later found to be inappropriate, due to it also being a place of work and study. 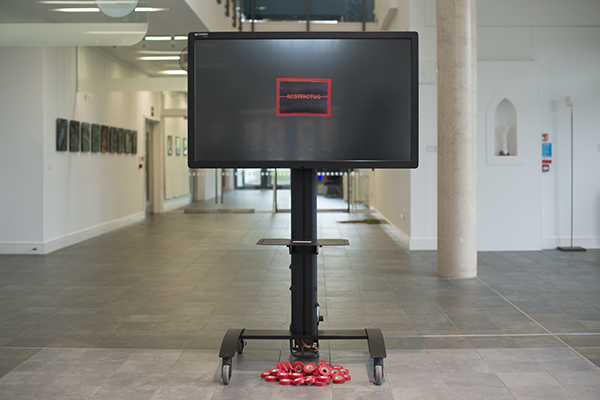 Staff and students found themselves involuntarily becoming part of the artwork, which led to the 12-hour piece being restricted and eventually shut down by the University after 1 hour and 47 minutes. This highlighted the restrictive nature of the institution.